Pressure cookers are totally useful kitchen tools—they can cook some long-cooking bean or stew or hunk of meat in much less time. Who doesn’t need to shave some time off the cooking process without totally bailing and ordering take-out? If I can help spread pressure-cooker love to just one more person, then my mission is done (well, not done but I’d certainly feel good about it). I just pressure-cooked a pot of chickpeas, and since I need something to post about, why not this? Again, I am sooo noooot a pressure-cooker expert. 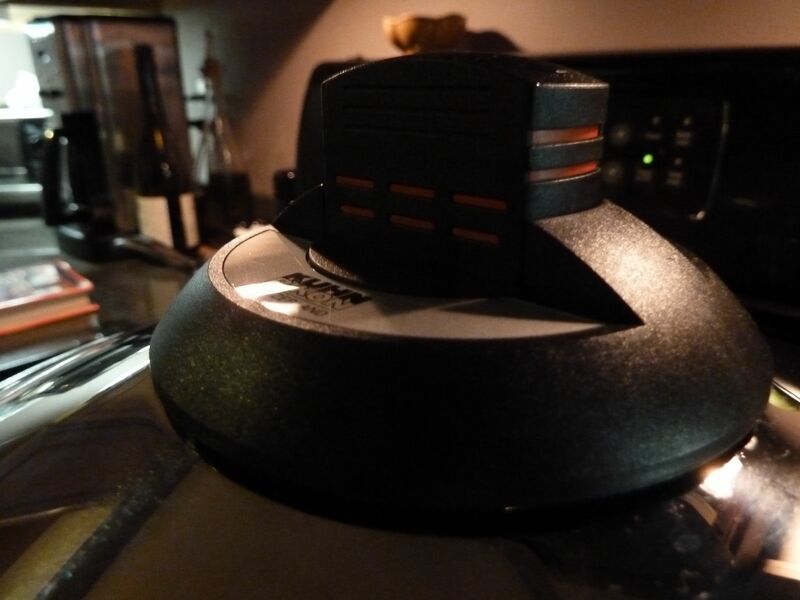 These are just some quick tips and bare-minimum suggestions from someone who was once afraid of the device and is now totally cool with its use. 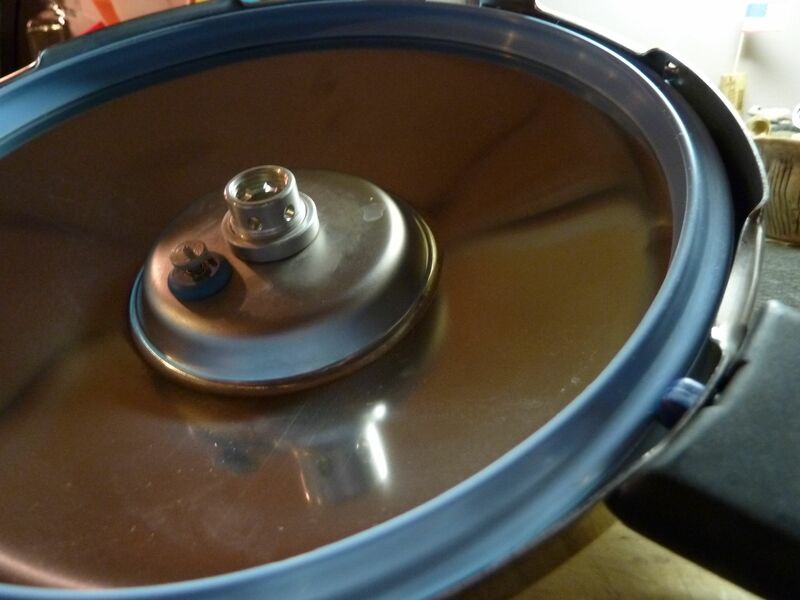 Completely forget the stories your Mom or Grandma told you each summer … the story about their pressure cookers explosively losing their lids as their batch of homemade tomato sauce was being sealed and canned for winter. Sauce everywhere, they said, and you didn’t believe a word until Mom redid her kitchen and they moved the stove and found the tomato splatter evidence. THAT’S. NOT. GOING. TO. HAPPEN. Not nowadays. Not with a) today’s technology and b) today’s litigious society. A lid explodes, a child gets hurt … that can’t happen. Spend the money. Buy a good, reputable brand. Jennifer bought a Kuhn-Rikon. It’s Swiss. And you know those Swiss. Read the manual. Seriously, do it. 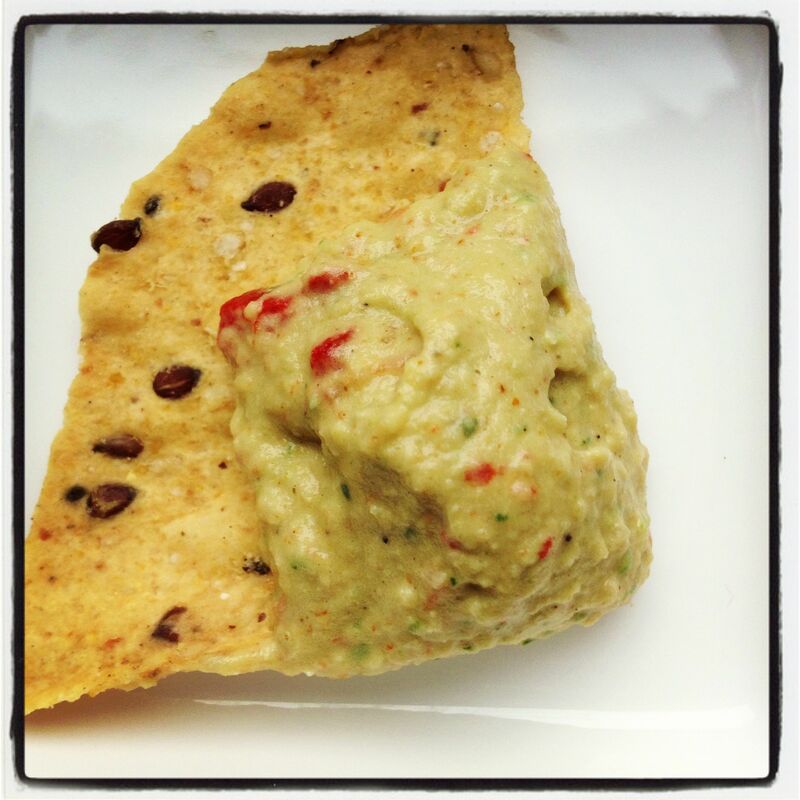 Get a specialty cookbook with pressure-cooker recipes. We have Pressure Perfect by Lorna Sass. It’s very useful. The gasket is important. It fits in the inner lip of the lid and helps create a seal within which the air pressure can increase. A damaged gasket? A missing gasket? No seal. Make a match. 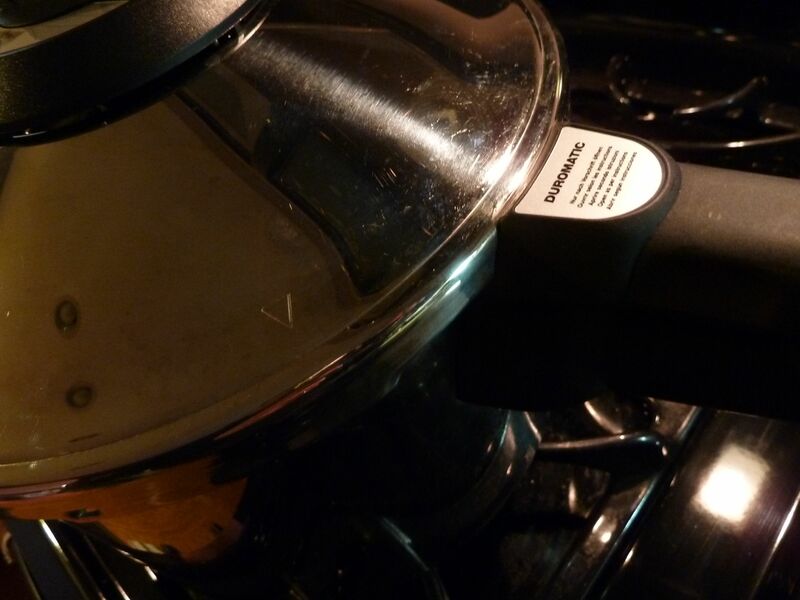 Most lids fit on the pressure cooker pot in a certain way and require a certain action. Ours requires that the arrow on the lid match with the arrow on the pot handle, and with those matched up, you then twist and lid into a LOCKED position. With the lid locked, it’s not going anywhere. Leave it be. When your beans or stew or whatnot is done, just turn the heat off and let the pressure come down naturally. There will be some sort of indicator on your lid that will tell you when that happens (more of an explanation below). The steam within the sealed pot is SUPER heated and can severely burn you. So, take your time opening the lid and always open the lid AWAY from you. IF YOU MUST open the lid soon, you can place the sealed pot under running water to help bring the temperature and the pressure down. Again, the indicator on the lid will tell you when they’ve come down. 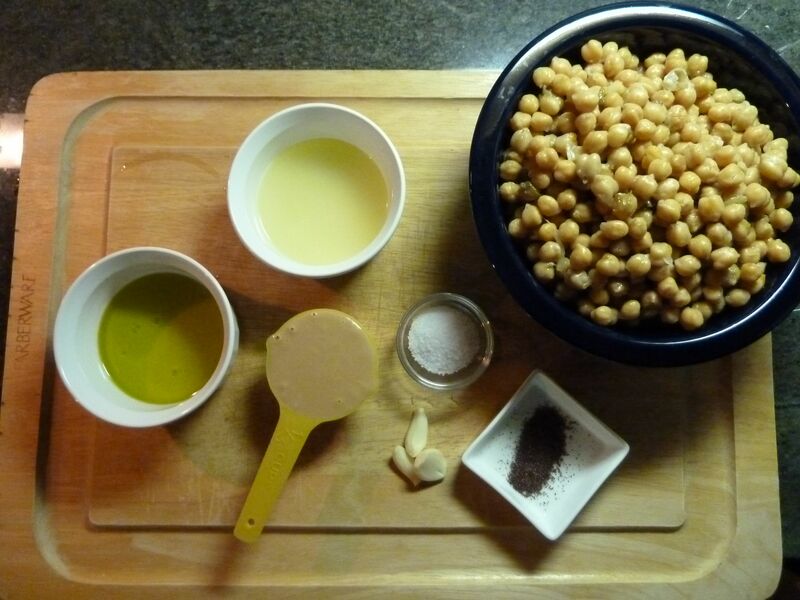 By way of example, here’s a simple recipe for cooking dried beans of any kind, and we used chickpeas. -Add all ingredients in a 6-qt. or larger pressure cooker. Lock the lid according to your manual. -Turn the heat on high and bring the pressure within the cooker to high. 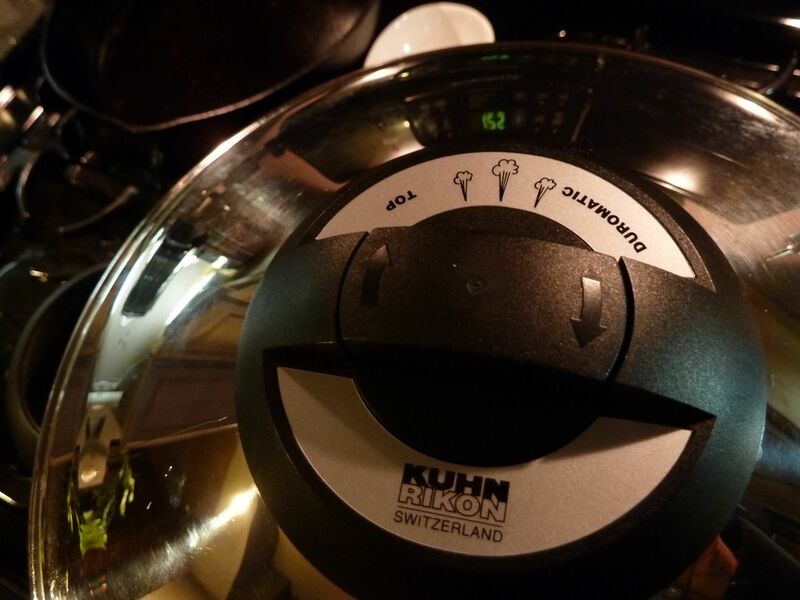 AS AN EXAMPLE, high pressure is indicated on our Kuhn-Rikon when two red bars appear. The two red bars indicate high pressure has been reached. -Turn heat down so it’s just hot enough to maintain the pressure at high. In our case, we turn our gas from high down to just between “2” and “lo.” That works perfectly. 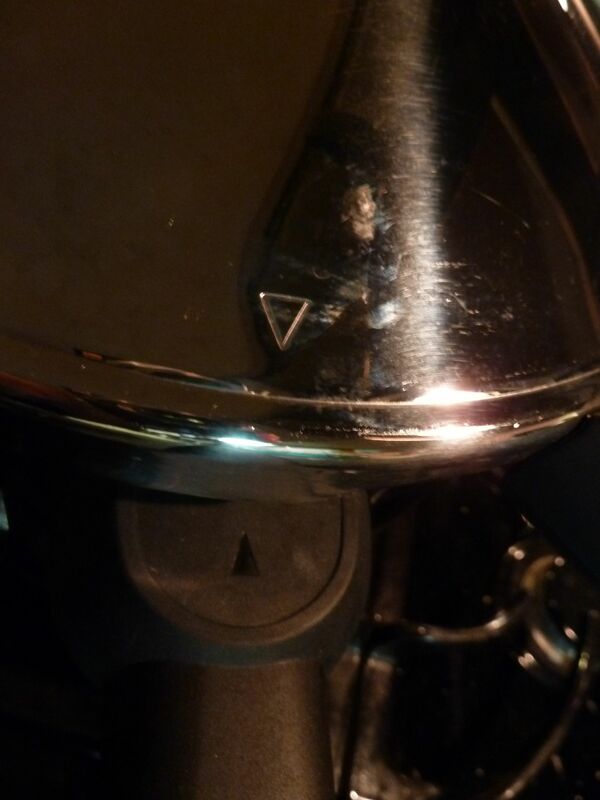 -Maintain high heat for the number of minutes indicated in your pressure cooker book for that specific bean. 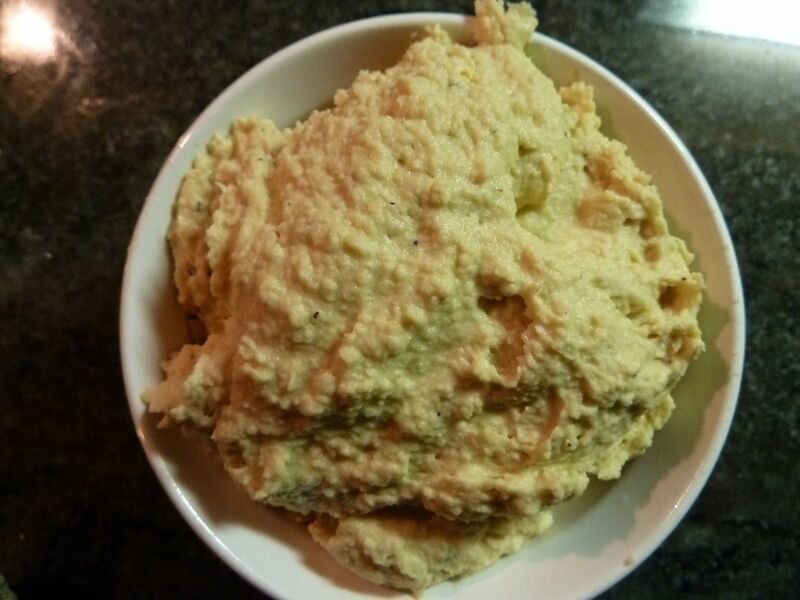 For chickpeas, that would be 28-30 minutes for a firm bean (for stews and such) and up to 35 for a softer chickpea that would be used in purees such as hummus. -When the timer goes off, you can let the pressure come down naturally (15-20 minutes or so) or put it under cool running water until the pressure comes down. TILT the lid away from you no matter what. You gotta be careful. 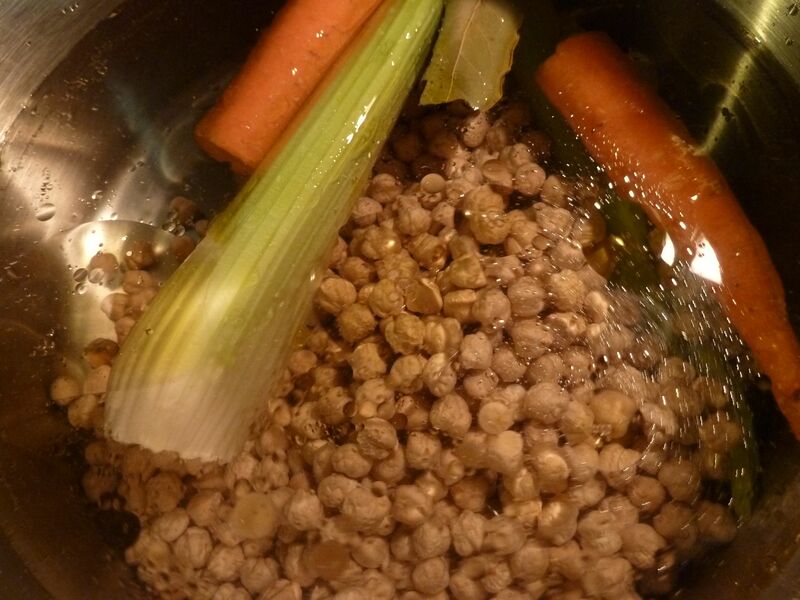 Chickpeas in their broth after about 28 minutes at high pressure followed by about 20 minutes on a natural cool-down. -Try a few. Too firm? Hard, in fact? Put the lid in place, lock it, and bring it up to pressure again for between 1-5 minutes, depending on how firm you think they are. Go through the same depressurizing process. -Look at that! You made beans!! -Lorna suggests that if you have the time, let the beans cool in their liquid. That way they will complete the cooking process. Meanwhile, remove the carrot, celery, bay leaves and garlic, and discard. -When you are ready to drain, you should totally reserve that cooking liquid. 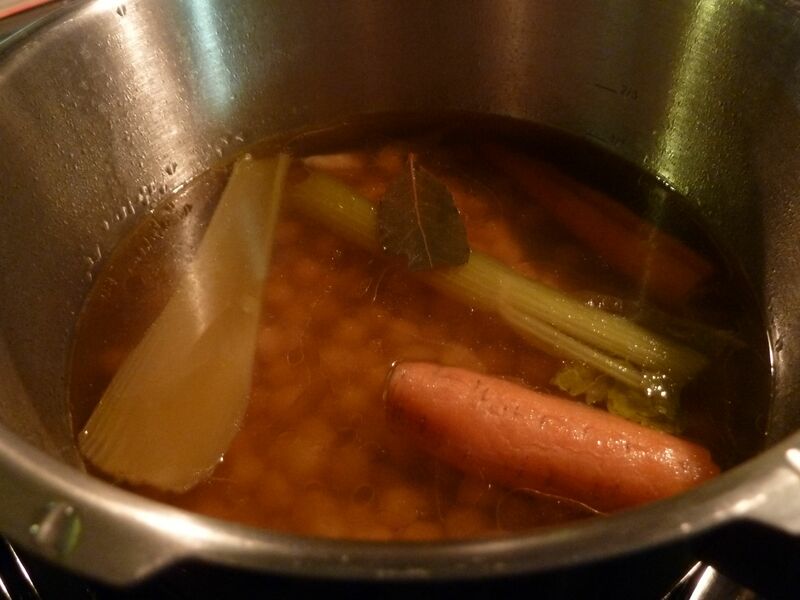 It’s ideal as a water or veggie stock replacement in soups or stews. So, put a colander over a bowl to catch the brothy goodness. 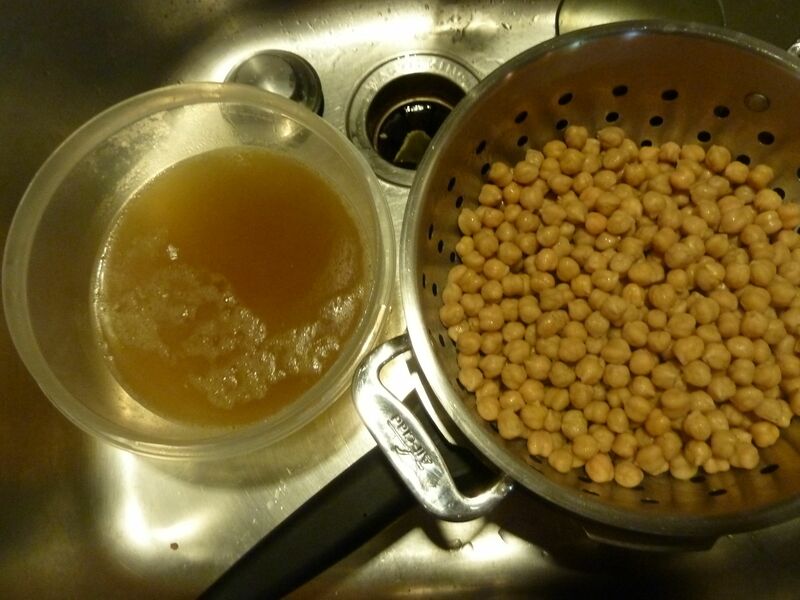 Reserve the tasty liquid and use it as a replacement for water or stock in soups and stews. Still on the fence about using a pressure cooker? Leave a comment below and let me know where you stand! You are currently browsing entries tagged with chickpeas at The Dainty Dot.